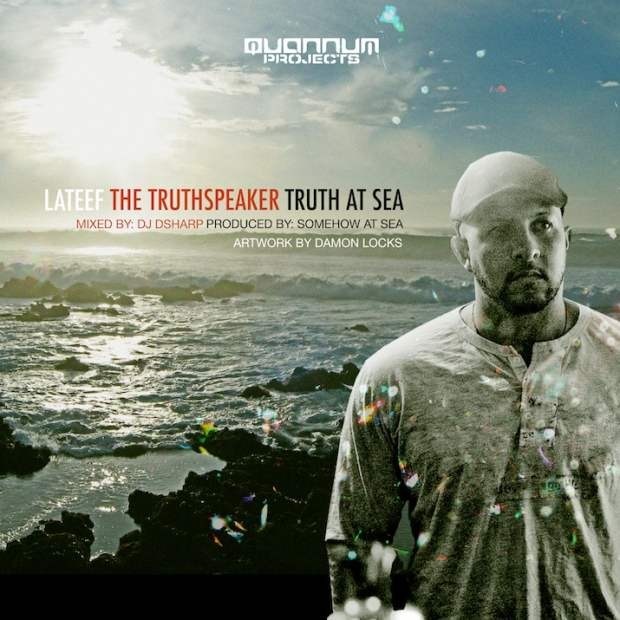 In support of Lateef The Truthspeaker's Firewire record in November, the Oakland MC crafted a seemless mixtape produced entirely by Somehow At Sea with mixing duties handled by DJ D-Sharp and DJ Icewater. For those in need of a tutorial, Somehow At Sea is an Oakland based production duo with a few revolving members that intermittently contribute to Rogue Wave, Sugar & Gold, Har Mar Superstar and Hot Tub. Dj D-Sharp and DJ Icewater keep the party on the move, creating minor-breakdowns for phone-in shout outs, to give Truth At Sea a Friday night radio show vibe. The 40-minute tape features guest appearances by Slug of Atmosphere, Trackademicks, Josie Stingray, Zach Rogue of Rogue Wave and Lateef's old pal from Latyrx, Lyrics Born. Portlandia's Fred Armisen took time away from mocking vegan hippies and covering Devo songs to show Lateef some love as well. The “Truth at Sea” mixtape is one of the riskiest mixtapes I've done. Part Hip-hop, part electronic, part crazy, it has some of my most spitfire verses to date as well as some of my most experimental singing song-writer stuff. Produced entirely by Somehow at Sea and featuring a small, handpicked group of guests, I'm very proud of the finished product. Download Truth At Sea here. Firewire is out November 8 on Quannum Projects.